Saying no to dessert is one of the hardest parts of eating healthy for me. It gets especially difficult during the holiday season or summer BBQs when there’s temtation everywhere. Then I discovered bliss balls. These sweet treats are packed with whole foods, healthy fats, and protein. There’s tons of great healthy bliss ball recipes out there but they just weren’t quite satisfying my cravings, so I decided to make my own. After some trial and error I finally landed on these super easy, no bake, Cacao Bliss Balls! Brownies are my favorite dessert and now that I finally have a healthy replacement it’s time to share it with the world! These little balls of gooey, chocolatey, goodness are so delicious that people actually mistake them for brownie bites. When I tell them all the healthy ingredients they are blown away. If you’re like me and used to think that a “healthy dessert” is some kind of mythical substance that can’t actually exist outside of your dreams, then you’re going to love these raw cacao balls (I guess that’s why they call them bliss balls). You can even get organic versions of all 7 ingredients from Thrive Market and save 25% off your first order! Easy and cheap, what’s not to love? Yup that’s it! All whole food ingredients with no added sugar, and full of protein, fiber, and healthy fats. These bliss balls are sweetened completely naturally with dates! These wonderful little foods are great for vegan desserts and can even be used to make vegan caramel! 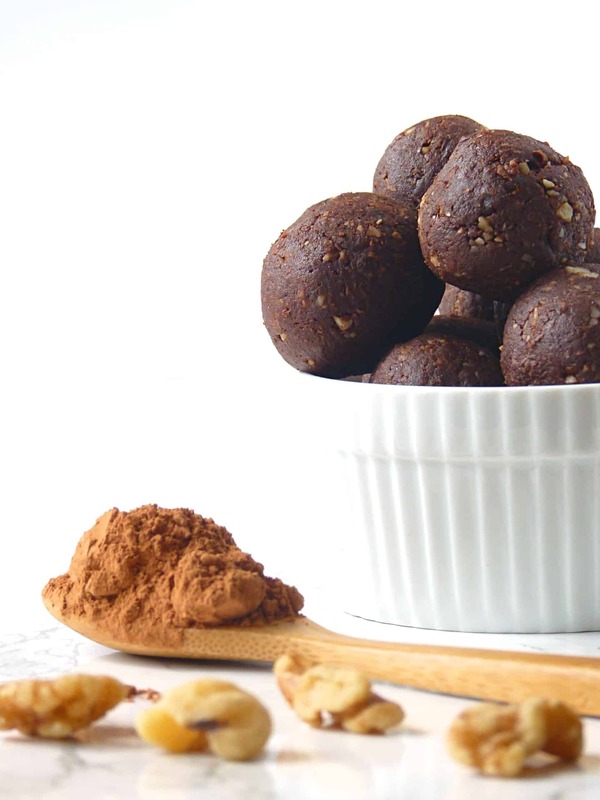 The secret ingredient in these vegan bliss balls is raw cacao powder. If you aren’t already familiar with cacao, check out my post on it’s health benefits and how it differs from cocoa. In addition to cacao’s amazing health benefits, it also gives our bliss balls their delicious chocolate flavor without all of the fat and sugar associated with chocolate. There’s a reason raw cacao made my list of best superfoods! Since raw cacao is in its purest form, it is even more bitter than dark chocolate (around 60-70% cacao). The sweetness of the dates counteracts this without having to add any extra sugar! I like to steep my dates in warm water for around 10 minutes to bring out more of their sweet caramel flavor. This cacao bliss balls recipe provides the perfect chocolatey base for you to get creative with and really make something unique. I even used this recipe as the base for my superfood peanut butter balls! There’s so many amazing toppings and flavor combinations to try, the possibilities really are endless. Coconut flakes and crushed walnuts are always great toppings and since they are already used in the recipe you should have them on hand. My favorite topping though is matcha powder. It’s green tea flavor pairs great with the sweet and nutty chocolate flavor of the bliss balls. Matcha powder also offers a variety of benefits of its own including a powerful dose of antioxidants and a nice natural energy boost. Matcha can turn these bliss balls into little cacao energy balls that make for the perfect afternoon snack if you’re feeling tired. Hemp seeds are another great topping choice if you want to add even more protein and fiber. Perfect for anyone with an active lifestyle that needs an easy on the go snack! To make these cacao bliss balls all you need is a blender or food processor! While you steep the dates for 10 minutes in warm water (helps bring out the sweet caramel flavor), blend the walnuts and almonds into a rough powder. Once the dates are done steeping you can add the remaining ingredients to the blender and mix until everything is broken down and the mixture has a “doughy” consistency. If you don’t have a high powered blender like a Blendtec or Vitamix you might need to do this step in a food processor instead. Most standard blenders tend to push everything to the sides and stop blending because there isn’t enough liquid ingredients for them. Once you have the dough, simply roll it into balls and then roll them in your favorite toppings. If you’re like me and enjoy the gooey brownie batter feel then enjoy them right away, otherwise put them in the fridge to set for around 30 minutes. Craving something sweet? Try these super easy, no-bake, Cacao Bliss Balls! Packed with healthy whole foods, these sweet treats are perfect for a guilt free dessert or a filling protein rich snack! Boost your bliss balls with some added protein! I use a protein brand called Gainful. They create a personalized protein blend for your specific needs whether that’s weight loss, muscle gain, recovery or more. They also cater to a variety of dietary needs like vegan, gluten-free, keto, and various allergies. You can find out which protein blend is the perfect fit for you by taking the protein quiz! If you tried this recipe don’t forget to post your pictures on instagram and use #livingfreshdaily I love to see your creations! Looking for more sweet and healthy snack or dessert recipes? Then you’ll love this mango chia pudding.